For simple, yet flexible home lighting control, Insteon’s dual-band technology is hard to beat. 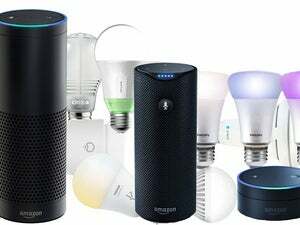 The company has been in the market longer than just about anyone else (more than 20 years), it has 200 connected-home products in its inventory, it offers great tech support, and it even operates its own online store dedicated to the connected home. As great as all that is, Insteon still has a ways to go when it comes to effectively integrating its disparate collection of devices with the smartphone app and the web portal that are designed to manage it all. That’s the conclusion I reached after reviewing Insteon’s 2582-242 Connected Kit plus a couple of connected LED light bulbs that the company recently submitted for review. The Connected Kit consists of Insteon’s latest hub, which you hard-wire to your home router/Internet gateway; a standard-definition pan/tilt security camera; motion, door/window, and leak sensors; and a wired thermostat. Insteon also sent a pair of 60-watt-equivalent LED light bulbs (these arevery expensive at $30 each—that’s twice the cost of the GE and Cree bulbs recently reviewed). If you buy an Insteon starter kit, make sure that it comes with the latest Insteon hub, as this kit does. I wasn’t able to test the thermostat, but it represents another weak spot in the Insteon ecosystem. On the one hand, it supports advanced features such as support for two-stage heating and cooling systems, duct dampers, and remote sensors. On the other hand, it’s aesthetically ugly compared to just about any modern thermostat on the market, it lacks a touchscreen user interface, and it doesn’t support heat pumps or three-stage HVAC systems. Fortunately, you’re not limited to Insteon’s thermostat. The company just announced that it has joined the Works with Nest program. I installed everything besides the thermostat and the IP camera in less than two hours. 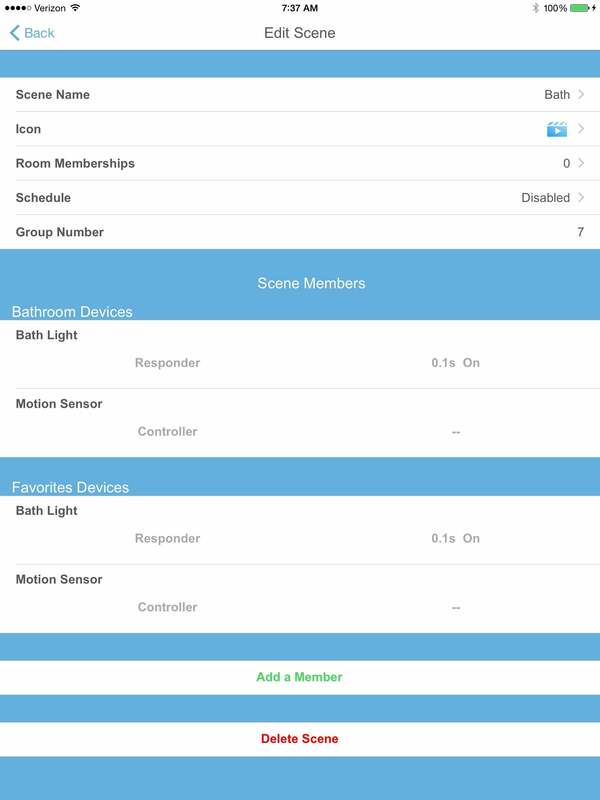 That includes the time it took to download and install the control app on my iPhone (there are Android and Windows Phone versions available, too) and to program rooms (groups of devices) and scenes (rules for controlling those devices). So far, so good. Insteon's thermostat is no great shakes, and the only alternative is Nest Learning Thermostat. My living room is lit by an overhead light and several lamps. I replaced one light bulb with a dimmable Insteon 60-watt-equivalent LED bulb and plugged two other lamps into plug-in dimmer modules (these cost $50 each if you need more than the two that come in the kit). 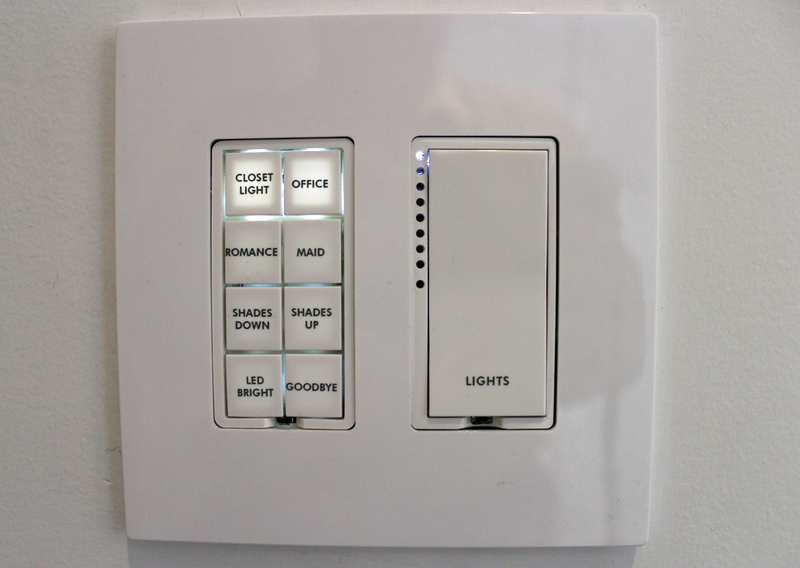 Insteon also offers in-wall dimmers and switches (priced from $50 to $80, depending on their capabilities). Using the Insteon app, I grouped these devices into a room and created a scene that turned all the lamps on at sunset and off at 10pm. Sunset and sunrise are determined by the Internet-connected hub based your time zone and the current date. You can specify the level of dimming for each device, with ramp-up times as long as eight minutes. 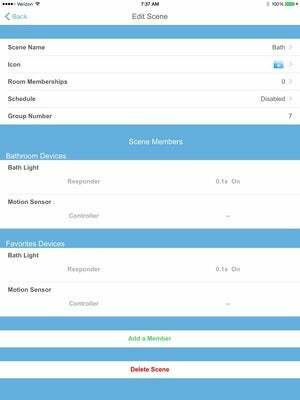 You can create different schedules for every day of the week, if desired, or you can establish scenes with different combinations of lighting for particular scenarios: Reading, watching movies, or even the time of day. While I didn’t test any of them, Insteon also sells a variety of in-wall keypad dimmers that can control a local load plus other devices or groups of devices on the Insteon network. Insteon will even print custom labels on the keypads for you (for an additional fee, of course). 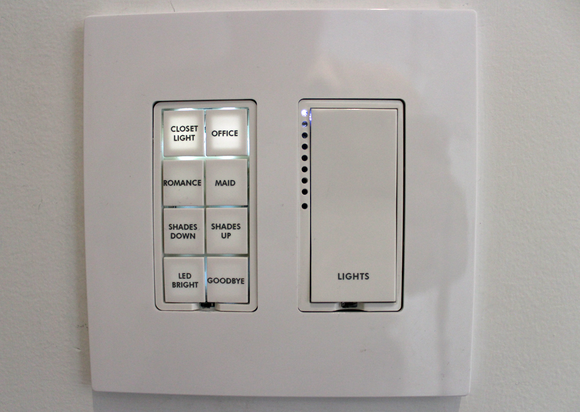 Insteon also offers in-wall switches, dimmers, and scene controllers. After I set up the living room, I installed an LED bulb and a motion detector in the bathroom. I programmed the motion detector to turn off the light after a couple minutes of inactivity, so I need never turn the bathroom light on and off. Finally, I added an open/close sensor to the front door and programmed it to turn on the lamp nearest the door. Performing these steps felt like time-traveling to the early days of home automation. To link the motion and door/window sensors to the devices you want them to trigger, for example, you must press buttons and then listen for beeps and watch for flashing LEDs for confirmation that the pairing worked. The old-school motion sensor, which runs on a 9-volt battery, even has jumpers and tiny dials that must be turned with a jeweler’s screwdriver (fortunately, these are present only for legacy installations—I didn’t need to fiddle with them). The door/window sensor, though, is obnoxiously large—it’s nearly 3.5 inches long. If you want something more discrete, Insteon’s hidden door sensor is available for the same price (but it’s not included in the package). 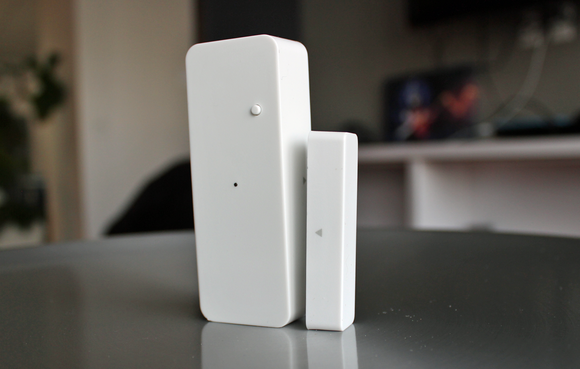 Insteon's surface-mount door and window sensors are obnoxiously large. Insteon’s proprietary dual-band network technology is unique in that many of its components utilize both power-line and RF control to provide fail-safe operation (exceptions include door/window sensors and motion sensors that operate on batteries instead of plugging into the wall). 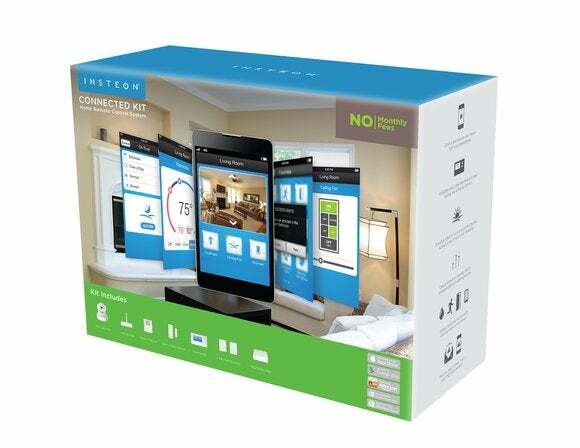 You manage your Insteon system through a web portal or with this mobile app. Like the RF-only Z-Wave technology, each Insteon device is both a transmitter and a receiver, and the resulting network forms a mesh. 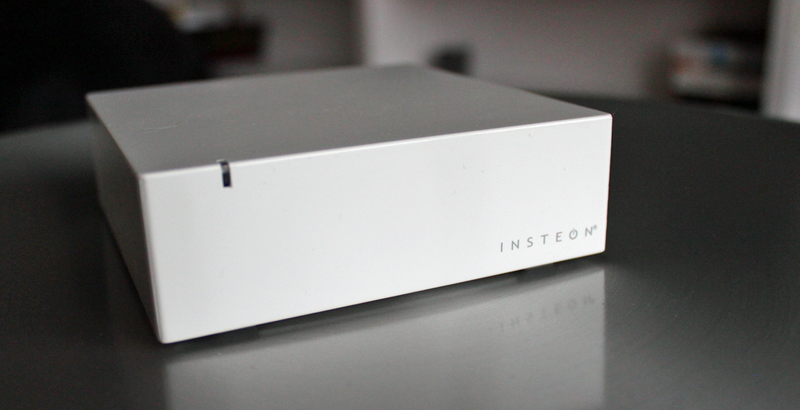 Unlike Z-Wave, however, Insteon doesn’t rely on a routing table. As a result, the Insteon motion and door/window sensors continued to control the lights, even after I unplugged the Insteon hub. The living room scene, on the other hand, ceased to operate, because it was operating according to a schedule that was controlled by the hub. So if you build a connected-home system with Insteon, don’t consider the hub to be an optional component. Setting up the Wi-Fi security camera, on the other hand, was a frustrating, four-hour experience that was not worth the end result. The camera is a Foscam clone—it’s based on the same hardware design and uses the same browser interface as that ubiquitous model—and it’s limited to resolution of 640x480 pixels. On the upside, it has a built-in motion sensor, infrared LED illumination for night-time viewing, and it can pan over a 300-degree range and tilt over a 120-degree arc. 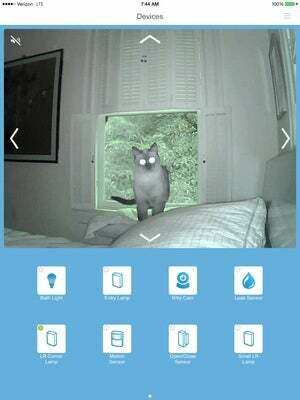 You can set it up to record video clips to a folder on your computer’s hard drive when its motion sensor is triggered, and it will send email alerts with images attached when it does. Insteon's security camera pans, tilts, and has infrared LED illumination for night viewing, but it delivers only standard definition. You’re supposed to be able to use the app to set up the camera, but it failed during several attempts. So I resorted to reading the manual and configured it using port forwarding and dynamic DNS so I could use its browser-based interface. You must connect the camera directly to your router via ethernet and then move it to where you want it to operate using Wi-Fi. If I had been setting up the camera on a weekday, I could have availed myself of Insteon’s excellent toll-free support—a service the company actively encourages you to make use of. That’s a rarity in the consumer-electronics market). Insteon’s tech-support folks will set up port forwarding and solve networking issues for you by taking control of your Mac or PC (just be sure you know your router password before you call). Support is not available on weeknights or Sundays, though, which is when most DIYers will need it. It's not enough to provide only a live video stream. 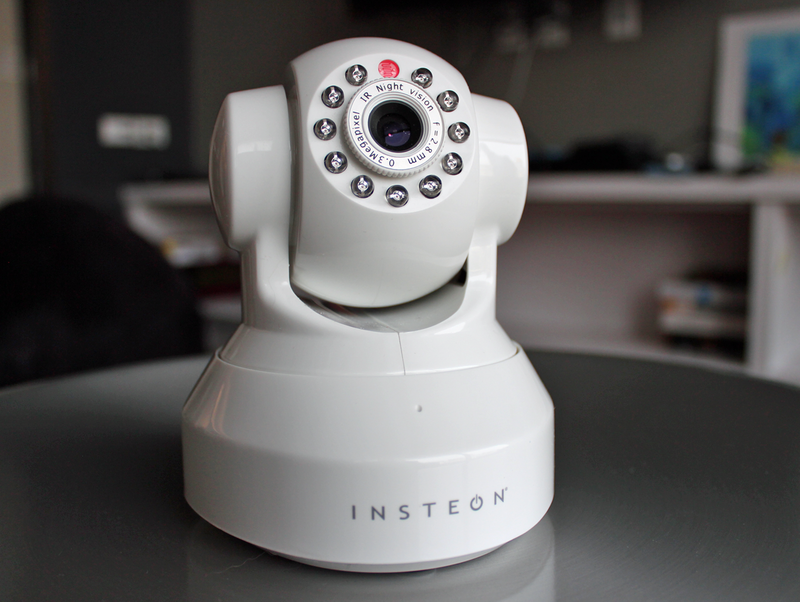 Insteon should allow you to view recorded video clips, too. I set up a kitty cam to keep tabs on my cat while I was away, and the live feed worked well even over LTE. I could pan and tilt the camera to find him no matter where was in the room, and the infrared night vision provided a clear picture. Insteon’s app lets you watch live video on your smartphone or tablet, but it has no provision for watching recorded video. As such, it’s no competition for newer IP cameras such as Dropcam or Simplicam. And the fact that you can’t trigger other Insteon devices, such as lights, without first leaving the camera’s user interface renders it inferior to the camera that comes with the recently reviewed Peq connected-home system or the camera that comes with the Lowes Iris system. 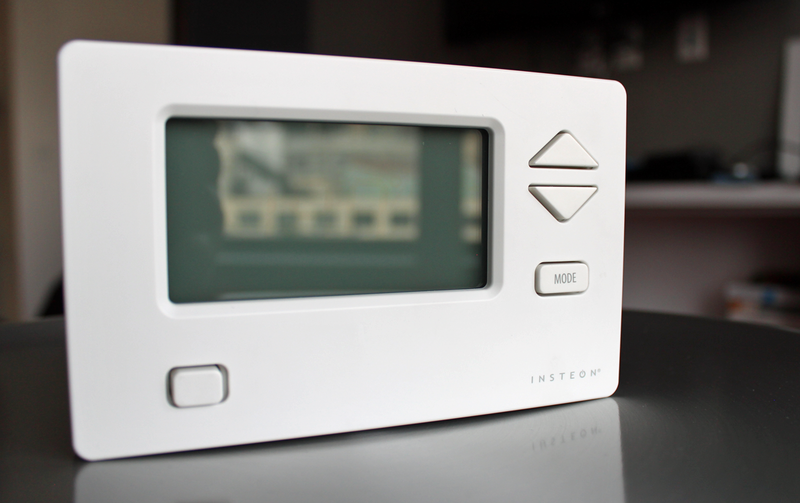 In Insteon’s favor, there are no monthly subscription fees to pay (both the Peq and the Iris systems cost $10 per month for full functionality). Is Insteon the right choice for you? I’d be a lot more enthusiastic about Insteon if its security camera and mobile app weren’t so weak, and if there was a more sophisticated means of configuring its sensors. The thermostat is pretty bad, too, but there’s a workaround—as long as you like the Nest. Insteon’s inventory of connected-home components is deep and wide in most areas, yet it offers only three types of connected LED bulbs—and those are expensive. The bottom line: Insteon is a very good connected-home system, but the weaknesses I’ve described keep it from being one of the truly great ones. Insteon's Connected Kit is a very inexpensive, but its weak camera and clumsy installation procedures (in some areas, but not others) drag down our opinion of the system as a whole.